Hong Kong: Asian stocks closed mostly higher on Tuesday as investors traded on speculation that the US Federal Reserve will cut US interest rates by at least a quarter point, and possibly even more. However, some in the market believe a 50 point cut is possible in the face of a protracted housing slump and tighter global credit conditions, and if this proves correct, then an equities rally would follow in the near term. Such expectations helped markets in Jakarta—up 0.7%— and Mumbai—up 1.81%—end the day clocking record highs, and while Hong Kong surged 2.55%, Seoul rose 1% and Singapore gained 1.01%. Tokyo was 0.76% higher, as Taipei advanced 0.47%, Sydney rose 0.80%, Wellington gained 0.76%, as Shanghai rose 0.25% and Kuala Lumpur was up 0.6%. Bangkok and Manila were little changed. Japanese share prices closed up 0.76% at a one-month high on hopes of another rate cut by the US central bank to invigorate the American economy. 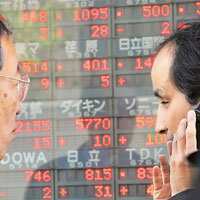 The Nikkei-225 index gained 120.33 points to end Monday at 16,044.72. Volume traded fell to 1.68 billion shares from 1.82 billion on Monday. Investors were waiting for the US interest rate decision due later on Tuesday with another cut seen as a done deal, dealers said. While there was some uncertainty about the size of the expected reduction, dealers said that better than expected US jobs data last week had reduced the chances of Fed slashing rates by a hefty 50 basis points. “I think the market has already factored in a quarter point cut," said Hiroyuki Nakai, chief strategist at Tokai Tokyo Research Center Co. Ltd. “But if the Fed announces a 50 basis point cut, which I think is unlikely because the US market has risen considerably of late, it will be a big surprise" and might fuel a year-end rally in Japanese stocks, he added. Hong Kong share prices closed 2.55% higher as rate-sensitive property and banking stocks attracted strong interest ahead of an anticipated interest rate cut in the US. Dealers said the market was also supported by short-covering with investors accumulating large blue chips, such as China Mobile Ltd and HSBC Holdings Plc., aside from local properties. Investors set aside concerns that Beijing might adopt more tightening measures following strong inflation data in November, as China financials and select properties posted gains. On Tuesday, the Chinese government said the country’s inflation rate accelerated to a decade high of 6.9% in November, compared with a year earlier. Growth in the consumer price index was up from 6.5% in October. Hong Kong’s Hang Seng index closed up 725.74 points, at 29,226.84. Australian share prices rose 0.8%, following a positive lead from Wall Street on expectations of a US interest rate cut. The S&P/ASX 200 index closed up 55.3 points at 6,680.4. Investors focused more on the expected cut than UBS AG’s $10 billion (Rs39,400 crore) writedown on investments backed by mortgages. The Swiss investment bank revealed an $11.5 billion cash injection from the Singapore government and an unidentified West Asian investor. Chinese share prices closed 0.25% higher as investors bought consumer stocks as a play against inflation after monthly prices soared to their highest levels in a decade. Dealers said stocks eked out a positive finish after spending much of Tuesday’s afternoon in negative territory following the announcement from the statistics bureau that the key monthly inflation index had jumped 6.9%. The release of the data, which included a near record widening in China’s trade surplus that hit $26.3 billion in November, came a week after the policymaking elite met in Beijing, agreeing that curbing inflation was a top priority in the new year. Analysts said that investors had largely factored in expectations for high inflation data and that had tempered wild swings common to the Chinese mainland exchanges. The Shanghai Composite Index was up 13.16 points at 5,175.08. Taiwan share prices closed 0.47% higher as investors took their lead from Wall Street’s stronger close on positive housing data and expectations that Fed will cut US interest rates late on Tuesday.